(Nanowerk News) In finally answering an elusive scientific question, researchers with the U.S. Department of Energy's Lawrence Berkeley National Laboratory (Berkeley Lab) have shown that the selective placement of strain can alter the electronic phase and its spatial arrangement in correlated electron materials. This unique class of materials is commanding much attention now because they can display properties such as colossal magnetoresistance and high-temperature superconductivity, which are highly coveted by the high-tech industry. Junqiao Wu, a physicist who holds joint appointments with Berkeley Lab's Materials Sciences Division and the University of California-Berkeley's Department of Materials Science and Engineering, led the study in which it was demonstrated that irregularities in the micro-domain structure of correlated electron materials - a phenomenon known as "phase inhomogeneity" – can be generated by external stimuli and could be engineered at the sub-micron scale to achieve desired properties. "By continuously tuning strain over a wide range in single-crystal vanadium oxide micro- and nano-scale wires, we were able to engineer phase inhomogeneity along the wires," says Wu. "Our results shed light on the origin of phase inhomogeneity in correlated electron materials in general, and open opportunities for designing and controlling phase inhomogeneity of correlated electron materials for future devices." Wu is the corresponding author of a paper describing this work which was published in the journal Nature Nanotechnology and is entitled: "Strain engineering and one-dimensional organization of metal-insulator domains in single crystal VO2 beams." Co-authoring the paper with Wu were Jinbo Cao, Elif Ertekin, Varadharajan Srinivasan, Wen Fan, Simon Huang, Haimei Zheng, Joanne Yim, Devesh Khanal, Frank Ogletree and Jeffrey Grossman. Whereas in conventional materials, the motion of one electron is relatively independent of any other, in "correlated electron materials" quantum effects enable electrons to act collectively, like dancers in a chorus line. 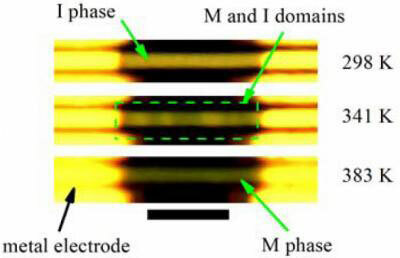 Emerging from this collective electronic behavior are properties such as colossal magnetoresistance, where the presence of a magnetic field increases electrical resistance by orders of magnitude, or high-temperature superconductivity, in which the materials lose all electrical resistance at temperatures much higher than conventional superconductors. Frequently observed spatial phase inhomogeneities are believed to be critical to the collective electronic behavior of correlated electron materials. However, despite decades of investigation, the question of whether such phase inhomogeneities are intrinsic to correlated electron materials or caused by external stimuli has remained largely unanswered. "This question is not only important for our understanding of the physics behind correlated electron materials," says Wu, "it also directly determines the spatial scale of correlated electron material device applications." To determine if phase inhomogeneity can be caused by external effects, Wu and his colleagues worked with vanadium oxide, a representative correlated electron material that features a metal-nonmetal transition, where in the nonmetal state its electrons can no longer carry an electrical current. After synthesizing the vanadium oxide into flexible single-crystal micro- and nanowires, the research team subjected the wires to strain by bending them to different curvatures. Different curvatures yielded different strains, and the phase transitions were measured in each of the strained areas. "The metal-nonmetal domain structure was determined by competition between elastic deformation, thermodynamic and domain wall energies in this coherently strained system," says Wu. "A uniaxial compressive strain of approximately 1.9-percent was able to drive the metal-nonmetal transition at room temperature." The ability to fabricate single-crystal micro- and nanowires of vanadium oxide that were free of structural defects made it possible to apply such high strain without plastic deformation or fracturing of the material, Wu says. Bulk and even thin film samples of vanadium oxide cannot tolerate a strain of even one-percent without suffering dislocations. Wu says that in the future strain engineering might be achieved by interfacing a correlated electron material such as vanadium oxide with a piezoelectric - a non-conducting material that creates a stress or strain in response to an electric field. "By applying an electric field, the piezoelectric material would strain the correlated electron material to achieve a phase transition that would give us the desired functionality," says Wu. "To reach this capability, however, we will first need to design and synthesize such integrated structures with good material quality."